A good friend of mine asked for some tips in the form of a post, so I’m a kind enough soul to oblige. I honestly think people try and get too fancy when they start eating clean and over complicate their meals. This ultimately means you’re spending WAY too much time in the kitchen and it’s not something you’ll stick to. I find meal prepping essentially while I’m training (more to come on that) or exercising a lot or else I’ll eat all of the things in sight. My personal definition of clean eating is: If I can’t read it, I don’t eat it. So, I skim the ingredients and if there are ingredients I can’t pronounce I don’t get it…for the most part. Because another part of my eating clean is the 80/20 rule. Staples: Make sure you have staples in your pantry. It will make your life easier. This will be very specific to you and your tastes. There are some standard staples I don’t have because I never use them. They just aren’t for me. This is important because it will help you always be able to whip something up at some point and not find yourself ordering out or buying lunch at work. At any given time, these can usually always be found in my kitchen. My staples include: pasta, rice, quinoa, couscous, barley, tortillas, eggs, bacon, OPA Greek Yogurt Ranch, mini babybel light rounds, milk or cream of some sort, bagel thins/flatout wraps, flour, nuts/nut butters, black beans, tomato paste, good quality Olive Oil, oatmeal, frozen fruit, frozen meat (chicken, steak, whatever was a good deal and I didn’t have planned to use) and tuna. I have a homemade biscuit mix, homemade pancake mix, a homemade SOS (soup or sauce) mix and homemade brownie mix, too. Those all stay in containers and just need the wet ingredients mixed in. 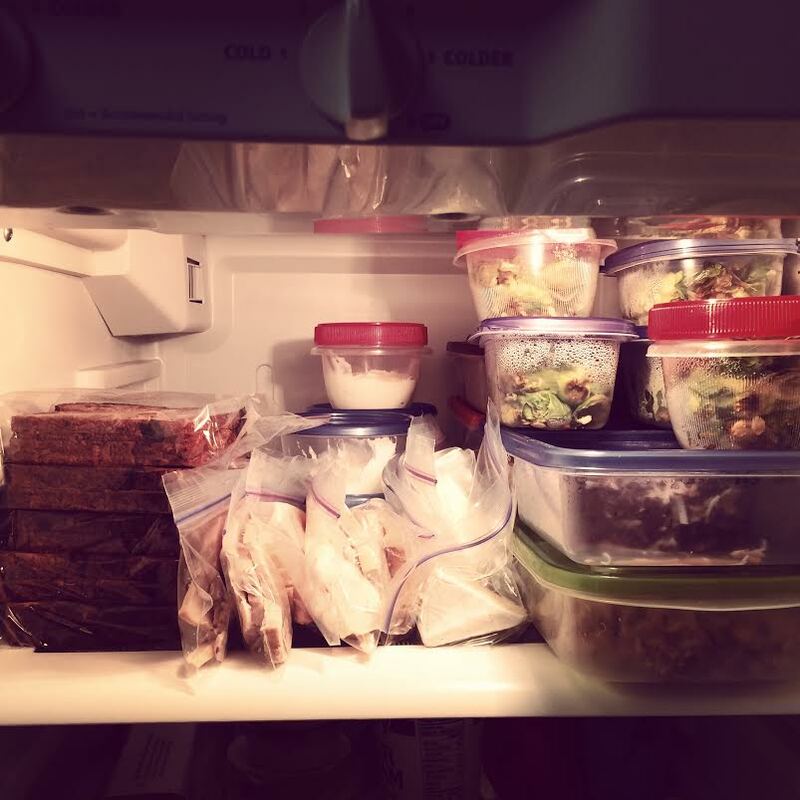 My process: I try incredibly hard to find a couple of hours every weekend to actually meal prep, but the planning starts way earlier in the week. I find a couple of good days that I know I can set some time aside to make myself successful. Typically, this means I grocery shop during the week and prep on the weekends. That’s crucial to not spending a whole day in the kitchen. If you grocery shop on Sunday and then prep on Sunday – say bye to Sunday. Every Monday I look over the local ads and base my menu based on the deals. It’s cheaper and easier and the in season produce will be the cheapest and tastiest. I look at Kroger and Fresh Market. There’s no particular reason other than they are both equal distance from my house and occasionally Fresh Market has incredible deals – but their ad changes multiple times a week so you have to check often. (Tuesday is their best deal day – you can usually get pretty good $2.99 deals.) I meal plan the ENTIRE week, I have even planned for a whole a month before. This means breakfast, lunch, dinner and snacks. I typically grocery shop on Thursday or Friday for the following week. I’ve found our Kroger is pretty slow on Thursdays and Fridays and since I’m there by 4pm I beat the post work rush. Also, Saturday before 8am is empty – but who wants to go that early? Scan your ad and make your menu/list. Since I’m feeling particularly lazy this week and not bulk making my lunches too, the easiest, simplest way to eat clean for lunch/while at work is to make extras at dinner and pack those for lunch. On average, we eat out once during the week to just get out of the house (especially since Kevin works from home). I’ve got a lot of the staples already: sandwich/wrap makings, frozen fruit, peanut butter, burgers (freezer), babybel, and biscuit mix. Side note: I’m a huge fan of the individual sized Justin’s Peanut Butter Packets – built in portion control, no added crap and easy packing. The first thing I do when I get home is prep my veggies for the week before I put everything away. It really doesn’t take that much more time (20 minutes or so to do it all). So, that means I’ve cut all my celery and put it in baggies, and put all my berries in baggies (don’t wash them until you eat them – they spoil if you do, berries don’t like moisture). Also, depending on the protein I buy, I will break it down then, too. So, I might go ahead and hand trim all my chicken breasts and de-vein my shrimp (let’s be honest, I buy them de-veined, but you get my point.) Doing all these little things ahead of time will ultimately save you tons of time. I give my cooked meat a one week life. So, if I grill off 6 chicken breasts on Sunday I feel totally fine eating one of them on Friday. This was last week. I prepped for the week on Sunday. My breakfast was oatmeal and chicken sausage, snacks were AM cottage cheese and tortilla chips with dry ranch (I’m addicted), and PM quest bar before I worked out, and lunch was a toasted turkey and brie on cinnamon raisin Ezekiel bread and roasted brussel sprouts. It sounds like a lot, but it I did it in about an hour. I made a double batch of roasted brussel sprouts, while they were roasting for 30 minutes I made a huge batch of oatmeal and dished it into 5 containers, with some chicken sausage for the week. (Breakfast done). After I weighed out 5 servings of cottage cheese, chips, turkey, brie, and also bread I put them all in ziplocs. By the time that was done the Brussel Sprouts were too so I portioned them out and was just about done. Like I said, it took me about an hour because of the way I timed everything. Conclusion: Once I’m totally meal prepped for the week the only thing I have to do when I get home from work every day is throw new containers in my lunch box and the old in the dishwasher. Dinner typically takes me anywhere from 30 minutes to an hour from start to finish, depending on what I made, but I enjoy the time. I’m never in a rush and find the process cathartic.